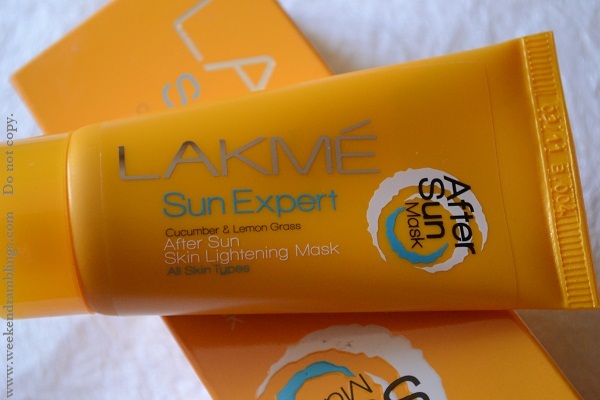 Lakme Sun Expert range consists of products speicifically designed to help protect and soothe the skin exposed to sun damage. 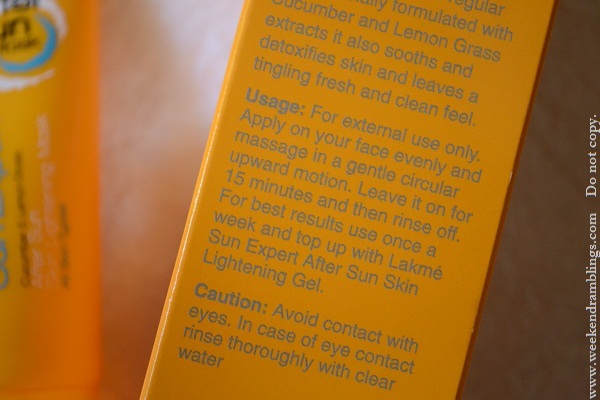 The goodness of cucumber and lemongrass and bright yellow packaging - it was instant attraction. 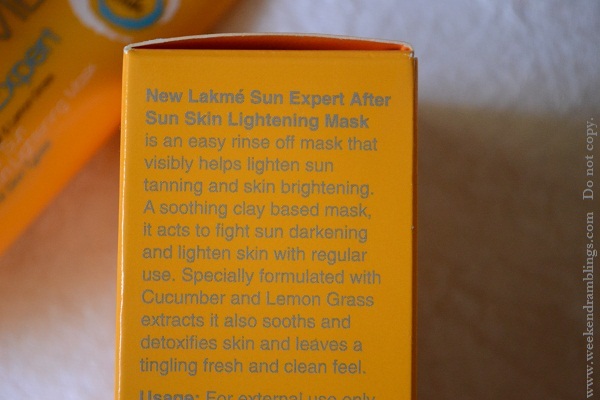 I have used and reviewed the Lakme Sun Expert face wash earlier, and this face mask is the second product I am trying from this range. 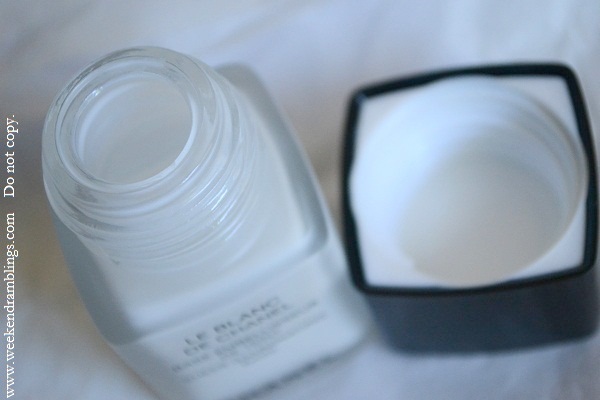 This mask is almost white in colour and creamy in consistency. 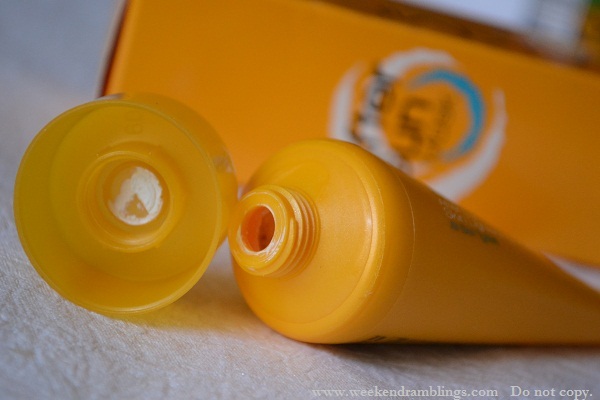 It comes packaged in a bright yellow tube with a screw-on cap - simple, no-fuss packaging that I love. This is quite fragranced and smells the same as the face wash from the same range - am not sure if that is the signature fragrance for the Sun Expert range. I use it as instructed, spreading the creamy mask on to my face and leaving it on for about 15 minutes. I wipe off the mask with a warm washcloth and rinse my face with cold water. Pat dry and follow with my regular moisturizer. I had a bit of irritation with this mask - like a slight burning - especially around my upper lip area. This is a common experience for me with most drugstore masks, and I guess it's a reaction to one of the many chemical ingredients that go into these products. It goes off soon enough as the mask dries and doesn't leave any effect on my face. 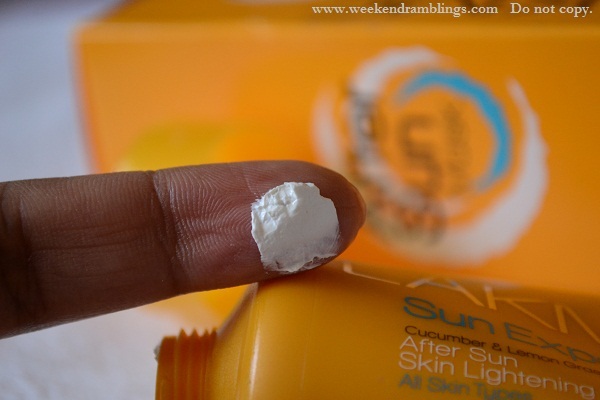 Results: I did not notice any skin lightening as such, but it did manage to get rid of some skin dullness that I had with going out in the sun. I find this a very basic mask which works well enough for me - I prefer a healthy looking skin to any whitening/lightening effect. No break-outs or pimples with this, but it didn't dry my skin out either, so that is another plus point. 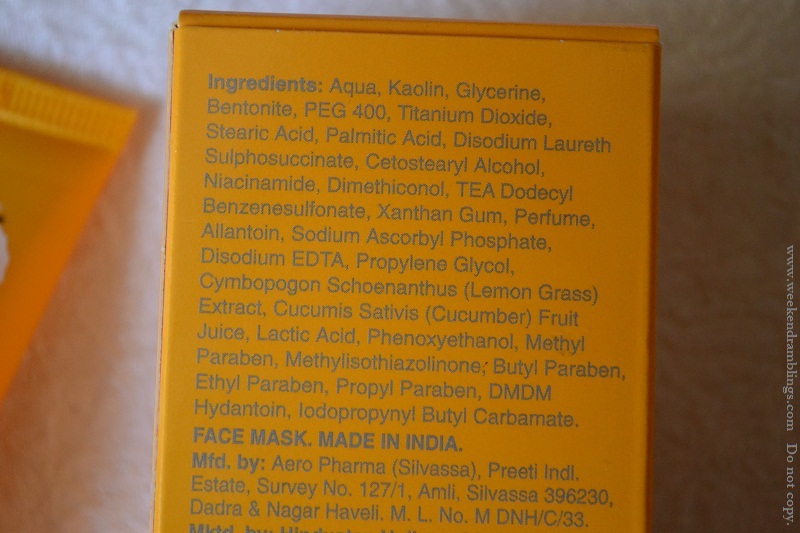 Overall, a basic inexpensive mask that seems perefect for most skin types. Might be a disappointment if you are expecting some drastic whitening effects, but it does give an evened out healthy look to the skin. Ingenious multi-tasking fluid 'primes' skin perfectly for makeup, while adding subtle contours and radiance to the face. A unique blend of powders reduces the appearance of wrinkles and fine lines for smooth, even, flawless finish." 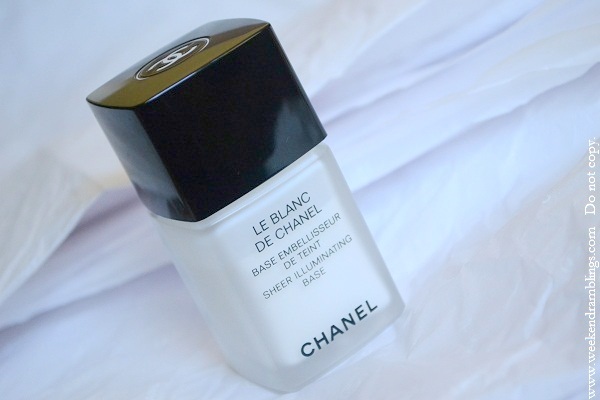 I bought Le Blanc De Chanel Sheer Illuminating Base a while back to use as a primer. I have read different reviews - just about every person using it differently with mixed results - so I really won't call this a review - more like my experience with the product. This is a white liquid - like a really thin lotion - that comes packaged in a wide-mouthed, heavy glass bottle with a screw-on lid. 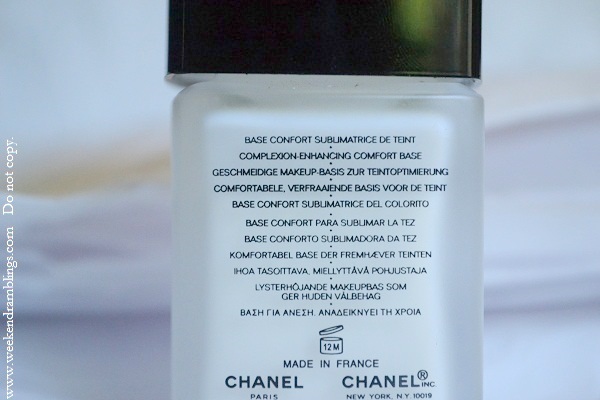 It has pleasant powdery-rose fragrance to it that is similar to some of Chanel's skincare lines (Hydramax gels, I think) and is something I am used to with Chanel products, but it might be an issue for anyone who prefers unscented products. 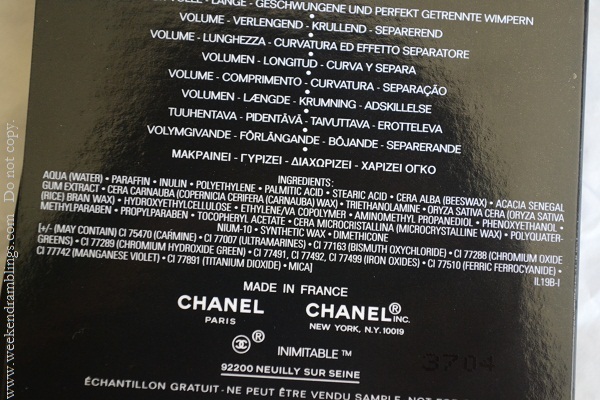 Chanel recommends shaking the bottle (specifically, to turn it upside down and straighten it a couple of times) to mix the product up before use. 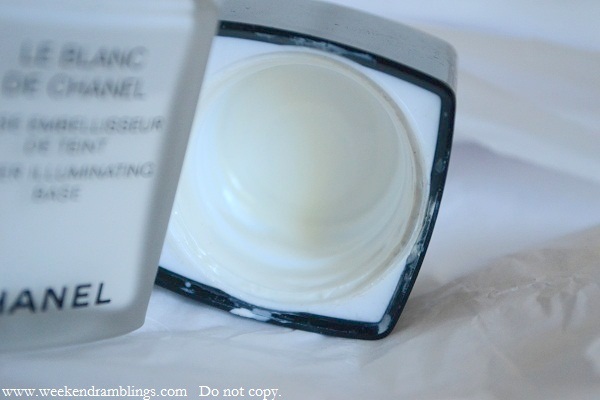 It gives a bit of a matte effect, and if it has any makeup-prolonging properties, it would be only because of this. Other than that, I did not find it to be of much use with keeping makeup on any longer than it would normally stay anyway. 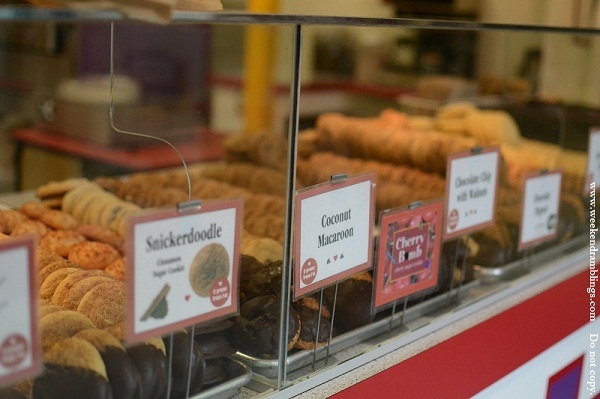 Easy to go overboard with. It takes some practice to figure out how much of the product to use. 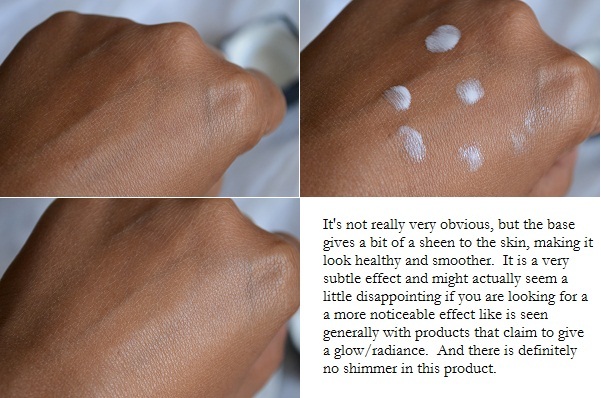 Apply more, and it can go from healthy sheen to whitish cast. 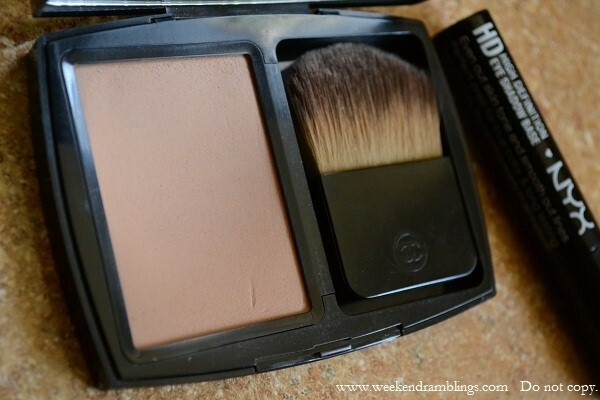 Can be used in the undereye area to brighten it up a bit or only on the cheekbones or any other area that you would want to highlight - I don't use it this way. Now on to the packaging - this is the biggest flaw in this product. As I said earlier, it comes packaged in a wide-mouthed bottle, and this gets very messy around the mouth and the lid - even if I am careful with tipping the product on to my hand. 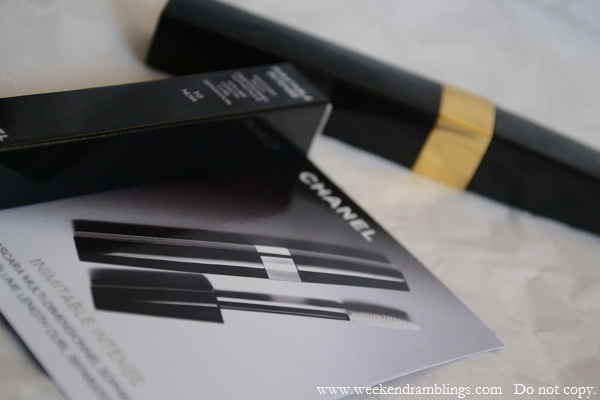 Chanel provides a spatula to use with this product, but I lost it ages back. Anyway, the product gets everywhere since you have to shake the bottle to mix it before using (and/or if you don't leave the bottle standing upright at all times). A lot of product wastage apart from the obvious mess. 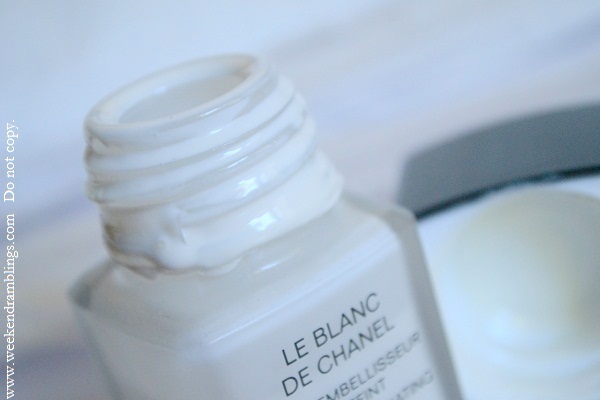 I love Le Blanc De Chanel Sheer Illuminating Base because of the natural-looking glow it gives whether used alone or under a non-matte foundation. 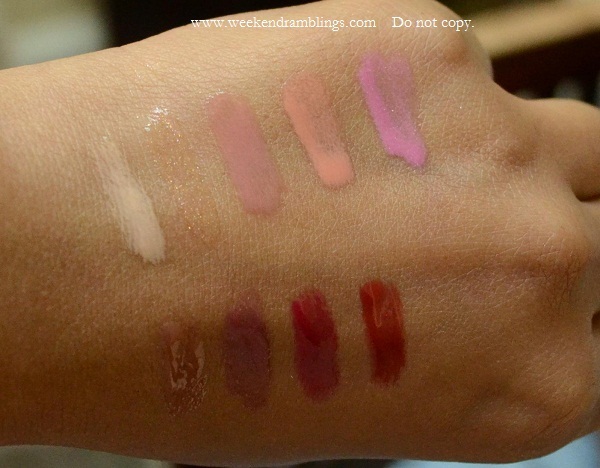 My preference is for sheer coverage, and I don't have a problem with my not-so-perfect skin being seen. Using this as a base, all my blemishes are still there, but somehow they seem softer and less "eye catching." If you are in the market for a silicone-free primer/base, you could give this a try, but I have read so many different reactions to this product, I would never recommend this to anyone without trying it in store first (or a sample if available). Need very little of the product, and a bottle would probably last a lifetime. 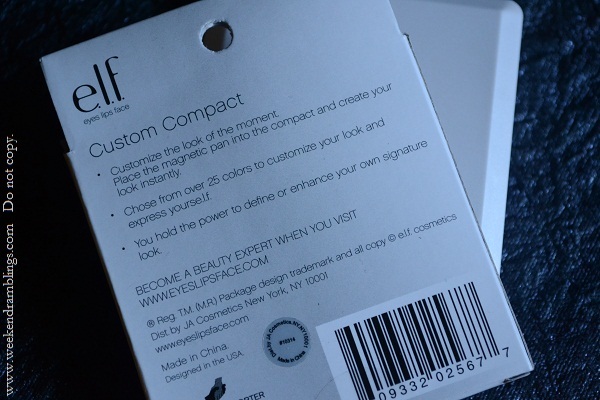 ELF makes some amazingly inexpensive products, but if I had to pick the most useful among all of their products, I think these empty, customizable palettes would easily be the winner. 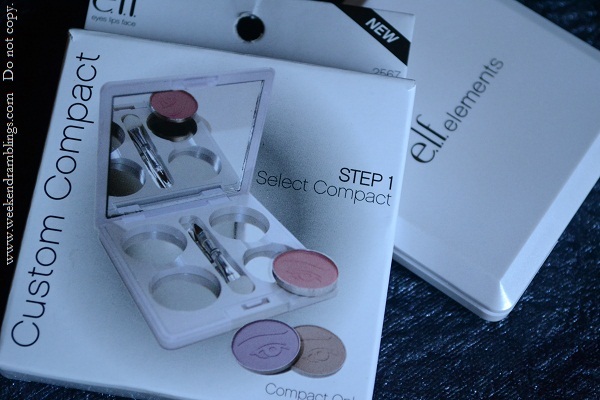 The ELF Essentials Elements Custom Compact is a sturdy white-coloured palette with a snap-shut lid. 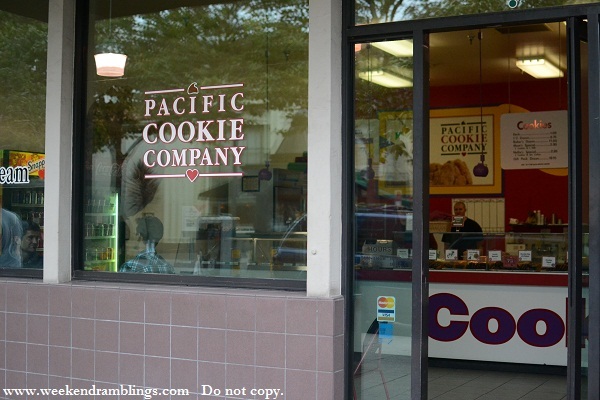 One side of the compact is a really big and useful square mirror while the other side holds the pans. These palettes are meant to be used with ELF eyeshadows/lips/blush palettes, but the size seems perfect for a whole lot of other brands. I tried with my Inglot eyeshadow pans, and they fit perfectly in the palette. I guess the plastic partitioning the palette can be taken out and you can fit more than 4 pans in there, but I haven't doing that - it needs to be pried out, and I didn't want to spoil the palette. 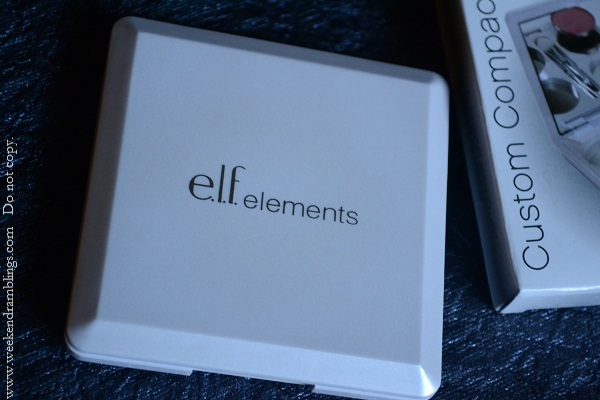 ELF Essentials Elements Custom Compacts with mirror. 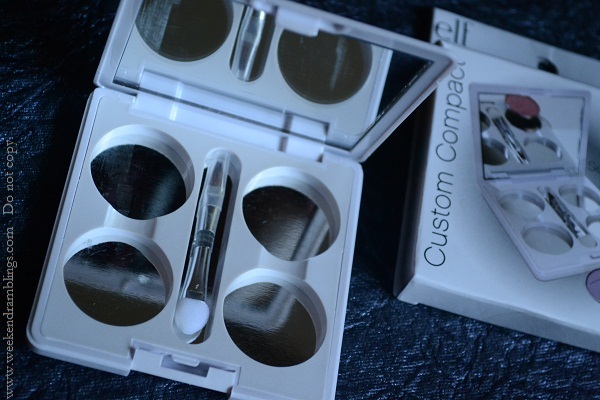 ELF Essentials Custom Compact can be used to fit MAC and Inglot eyeshadow refill pans apart from the regular ELF eyeshadows. The palette itself is not magnetized, and you would have to use either double-sided tape or some other adhesive of that sort (or magnetic strips) to get the pans to stick to the palette. This problem won't arise if you are using the ELF pans since those are magnetized (I think) but might be an issue if you are planning to use these with other brands. You can just place the pans inside and close the palette, and the shadows would stay intact, but it is a risk to take especially if it's going to be tossed around a bit. I bought mine from Target, so I could check before buying, but I have read reviews where people aren't very satisfied with the quality of the palette - not closing properly, etc. Mine seems perfect so far. 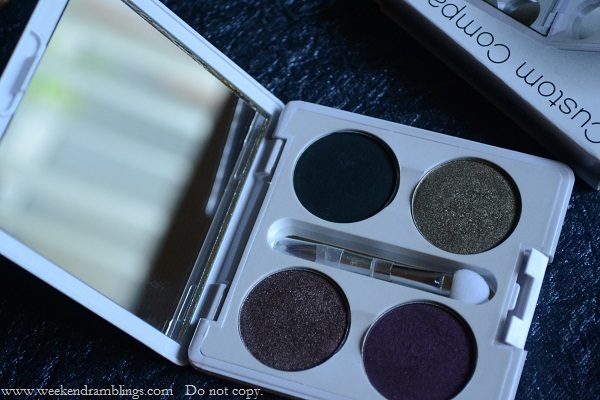 There is an applicator that comes with this palette. 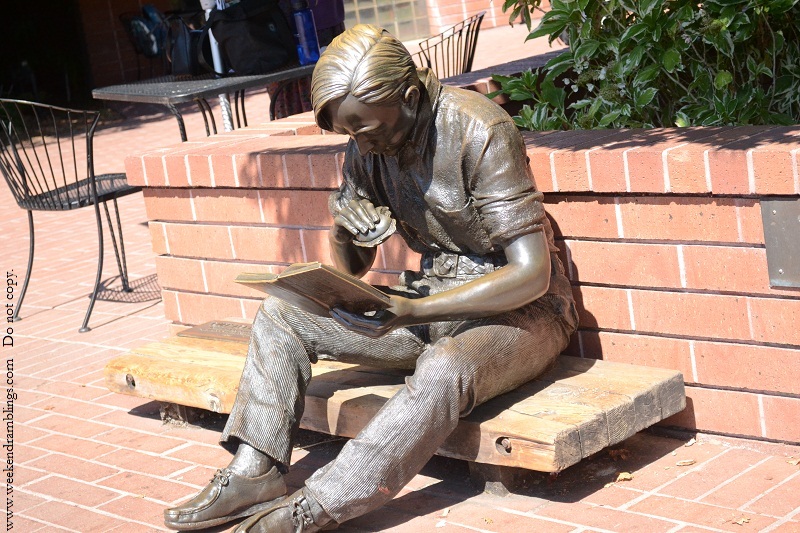 I don't understand why it has been put there. I found it absolutely useless and bad. I didn't have to pay any shipping charges since I picked these up in-store, and for a dollar, I really cannot find any faults with this. The brush is a big fat brush which makes the painting process quite fast, and the formula is nonstreaky and smooth. One coat goes on sheer, and this would work really nice for a french manicure. Three coats goes perfectly opaque and a pretty barely pink colour. Makes my hands look darker than what they already are, but I still like it. It's such a pretty pink how can anyone not like it???? Step I - The scary eye pic :P :P - Primer and set with powder. Step II: Tightlining. I use a black eyeliner pencil and line the waterline. Then, I use the same black pencil and line really close to the upper lashes - just push the pencil into the gaps between the upper lashes right at their base. I don't know which of the two is called "tightlining," but the aim is to give an appearance of darker, more full lashes, and give a bit of definition to the eye. It's quite easy to do (though it does feel ticklish) - just lift your eyelid gently and trace with the pencil. Step IV - Curl lashes and apply mascara. Won't bother with curling, but the curler is still quite new, and I am quite determined to use it :D Since I managed to dirty up the lower lashline with my repeated kajal application, I used a flat eyeshadow brush (because that's what I found) to smudge and spruce it up a bit. I try not to do this most times since I feel it makes my already huge eyes look bigger - not something I am aiming for, but if you have smaller eyes you might want to try this (and set it with a powder eyeshadow). 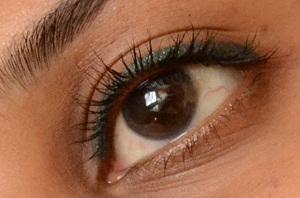 So that was my down-to-bare-necessities-only eye makeup - a black liner and mascara. What's your laziest, most basic eye makeup? 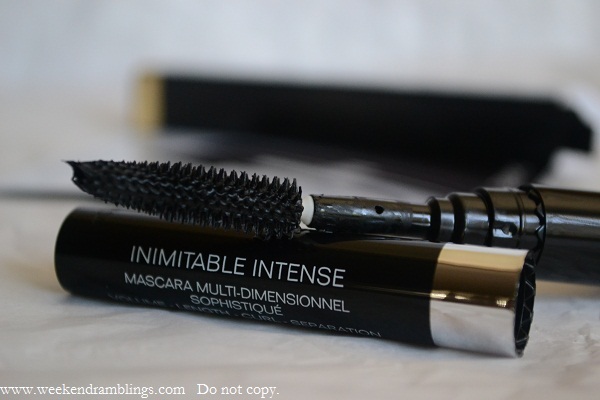 The Inimitable Intense Sophistique mascara is a part of the Chanel Sophisticated Eye collection in the US. Here's my comparison review of the two mascaras - a sample of Inimitable Intense Sophistique mascara and my regular Inimitable mascara. I have the black shade - Noir (10) - and it's not the waterproof version. I never use waterproof makeup if I can help it. 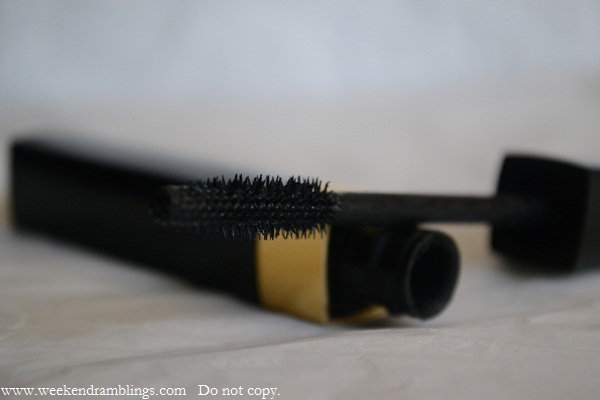 The wand has lots of short stubby brustles arranged in neat rows - helps coat the lashes evenly and provides perfect separation between the lashes. 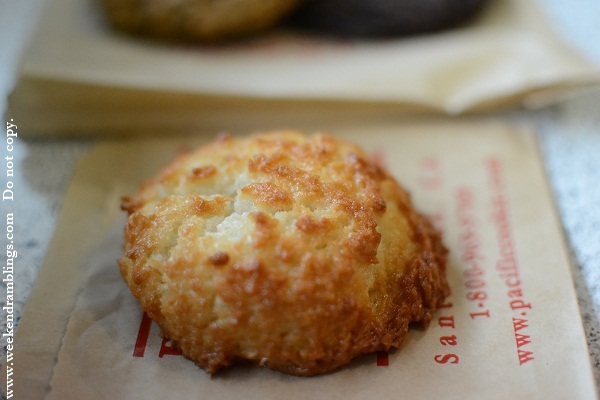 No clumps, better definition. That's the theory. Reality though, it's hit and miss - I have to pay attention while applying the mascara because it is very easy to get the lashes clumped together. I will give the formula a benefit of doubt, since it was a sample bottle, but I find it a bit too thick for my lashes. It does give volume and an appearance of length, and is perhaps more suitable for people who have less thick lashes. This is my older, full-size mascara. 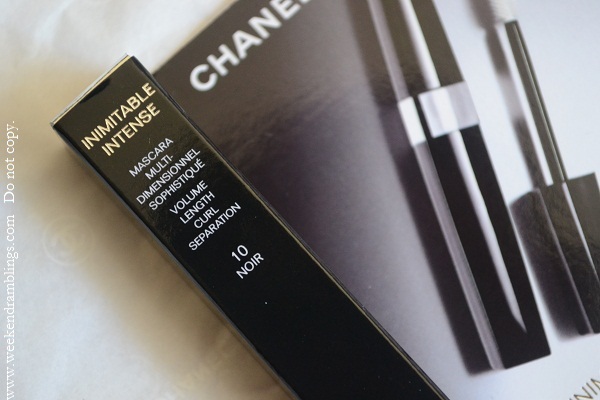 While Chanel claims the newer Inimitable mascaras are an improvement on these, I personally find the older ones better. The wand is the same - short bristles arranged very close together. 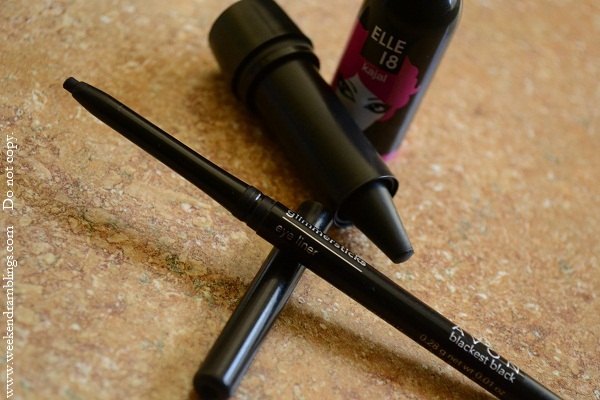 The formula is a little less thick and it seems better at giving clump-free application at least on my lashes. 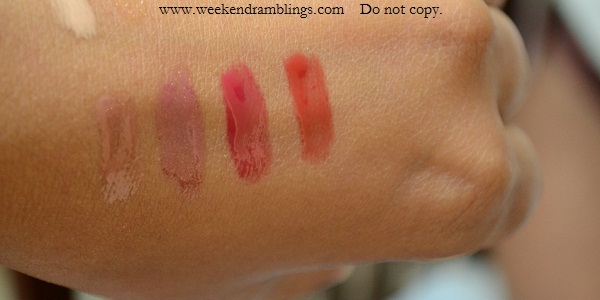 Overall, I prefer the older version of the Inimitable mascaras to the newer release. My favorite mascara continues to be YSL Faux Cils. 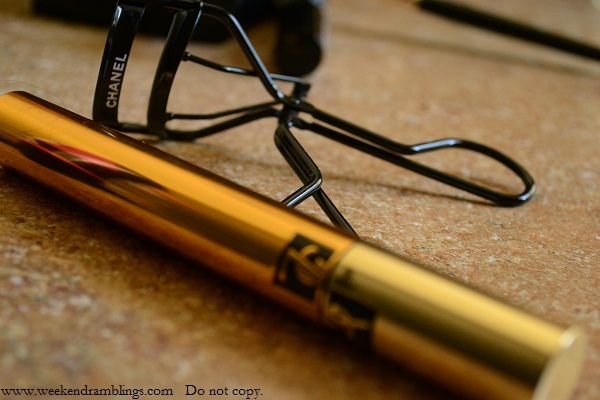 I really am not a fan of the Chanel mascaras (the Sublime de Chanel mascara seemed nice, though). 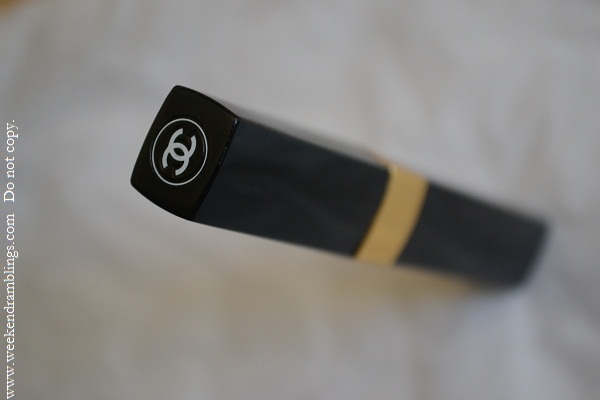 Without exception though, all the Chanel mascaras I have tried give a bit of curl to the lashes, even without using a curler. 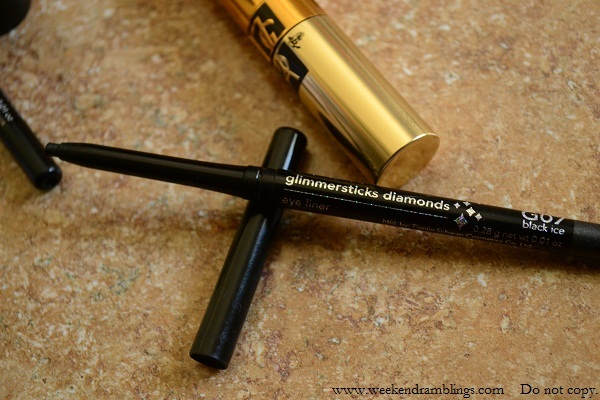 The wands and bristles are really nice at combing out the lashes, but I find the formula a bit thick and easy to clump if I am not careful while applying. 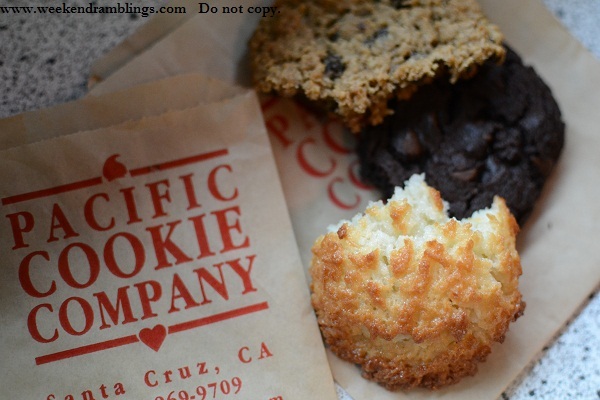 No flaking, smudging. If you have thinner/sparser lashes, these might definitely be your favorites. Draw liquid lines so sharp they could cut glass. Our slender brush lays down long-lasting matte, slick and shimmery shades sure to satisfy your color lust. Slim pens with ultra-fine brushes that create razor thin as well as thick strokes with ease, these are the ideal liquid liners for newbies. Waterproof. 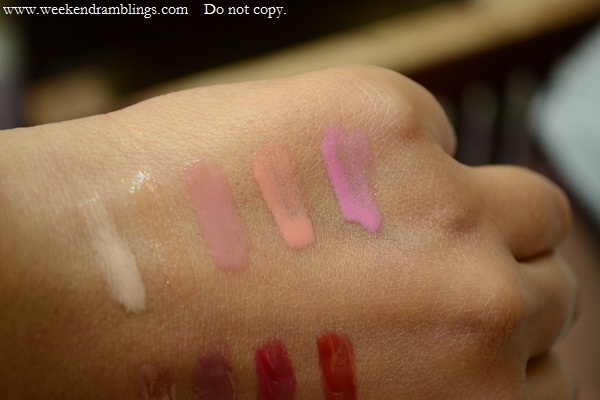 Shades range from matte to glossy to shimmery. 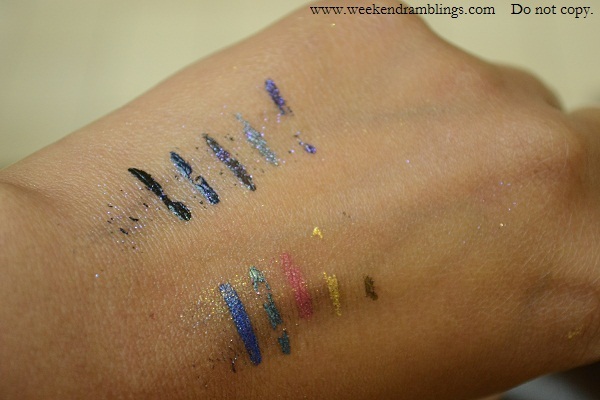 This was after I wiped the swatches with makeup remover wipes about 3 times. 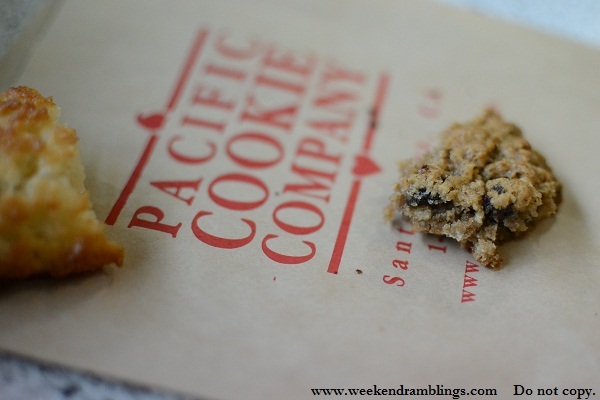 This is not a review, but I was quite impressed with the staying power of these liners. Brilliant shine. Intense color. The new Larger Than Life Lip Gloss provides lustrous shine that stays in place for hours, while lips feel protected and moisturized. This innovative and unique formula is infused with ingredients to nourish lips and fight free radicals, while natural lip enhancers provide volume. 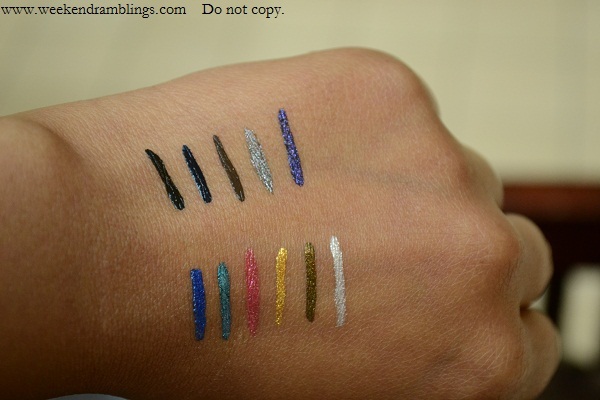 The texture glides on evenly, won’t feather, and stays on throughout the day. A new, shorter bristle brush delivers a precise application to define and shape lips. 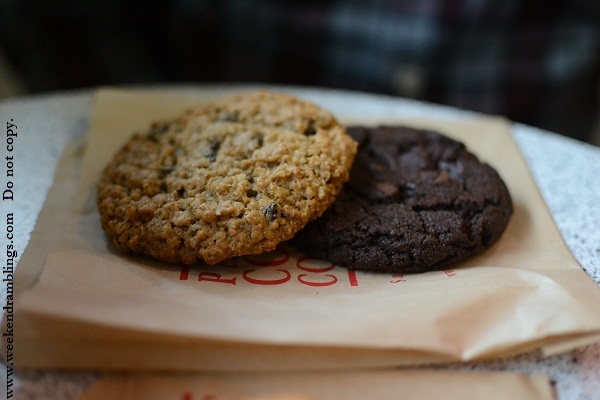 The new, clear packaging is indicative of its overall effect: bold, brilliant and luxurious. 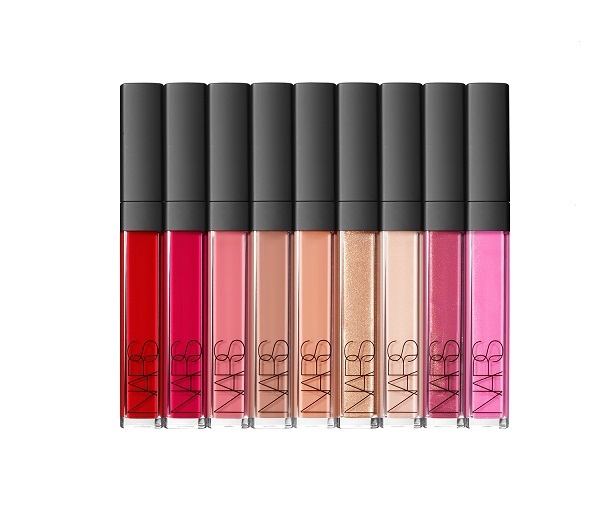 The collection of nine shades, ranging from cool beige and peach shimmer to rosy pink and cherry red, provide rich, intense color. • Hydracire – 100% natural origin plant waxes that combine sensorial and functional benefits of liquid emollients, butters and waxes with a lightweight feel. • Kalpariane – Stimulates collagen and has anti-aging properties that prevent elastin from degradation; moisturizes and improves suppleness of skin. • Volulip – Naturally-occurring peptide that improves and enhances the shape and volume of the lips by stimulating hyaluronic acid synthesis. • Rice Lipids – known to have film-forming benefits that contribute to improved wearability, moisturization and ease of application. • Jojoba Oil – known for its high levels of alpha, delta and gamma tocopherols, forms of Vitamin E that provide anti-oxidant properties known to help increase skin’s elasticity. 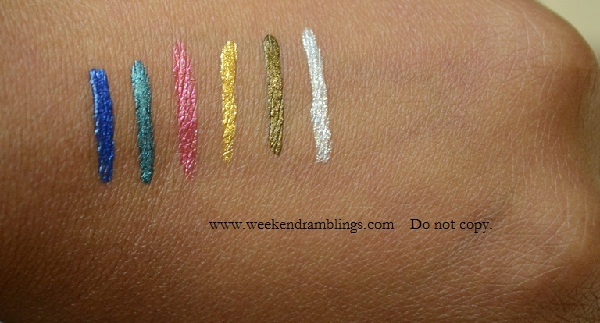 AVAILABILITY: Exclusively at Sephora and www.sephora.com beginning August 1, 2011. Note: Info provided by NARS. Swatch images are mine.